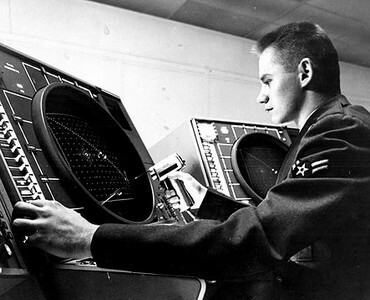 Built by IBM in the 1950s, the Semi-Automatic Ground Environment (SAGE) computers were used in an early U.S. air defense system. When fully deployed in 1963, the system consisted of 27 centers throughout North America, each with a duplexed AN/FSQ-7 computer system containing over 50,000 vacuum tubes, weighing 250 tons and occupying an acre of floor space. SAGE was the first large computer network to provide man-machine interaction in real time.